Singapore is one of the most connected countries in the world with a vibrant local social media scene. This article explores Singapore’s social media statistics across Facebook and Instagram (updated 2019). Few would be surprised that Singapore has a high Internet penetration rate of 82%. Social media has also taken hold of the population, with over 77% of the population reported being active social media users. We look at some of the key social media statistics in Singapore that can help every marketing and social media professionals better plan their strategies. As of 2018, Singapore has a population of 5.79 people million crammed into an island measuring just 719.9 km². In fact, it is the country with third highest population density in the world behind Macau and Monaco at 8,188.16 people per square kilometer (also the world’s most expensive city, but that’s not what we’re all here about, is it?). 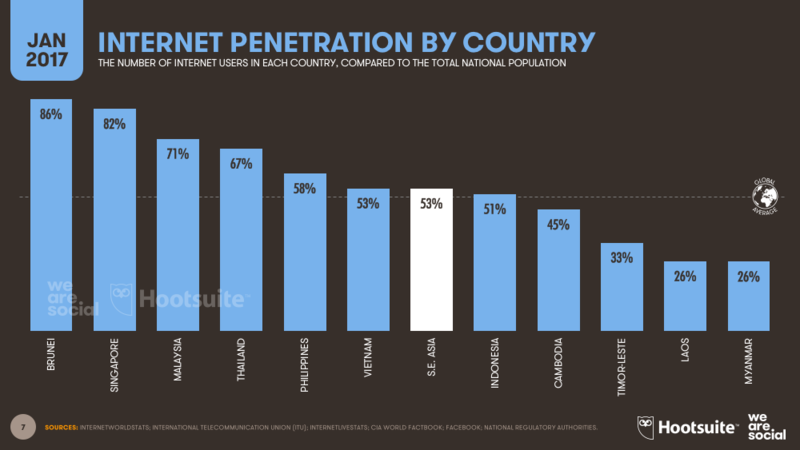 Singapore has an 82% Internet penetration rate. This is much higher than the global average rate of 50%. Singapore’s mobile penetration rate of 86% is the highest in the region. This means that optimising your website design and campaign for mobile devices is critical. If you’re planning on getting search engine optimisation services in Singapore, ensure that your SEO company is taking care of your mobile SEO as well. Singaporeans also enjoy high speed Internet access both on mobile and broadband. According to SpeedTest, Singaporeans enjoy an average fixed broadband download speed of 180.61 Mbps and average mobile download speed of 44.37 Mbps. This fast Internet access allows marketers to push the envelope when it comes to mobile marketing campaigns. They can create more rich media without worrying about Internet speed bottlenecks. 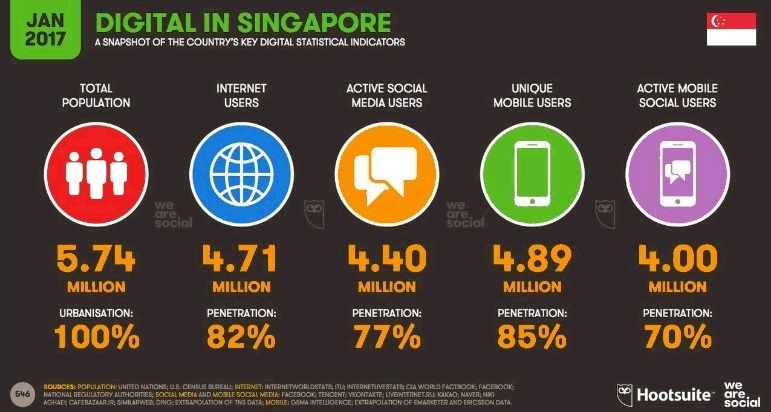 Singapore has 4.4 million active social media users. This translates to 77% of the total population being active social media users. 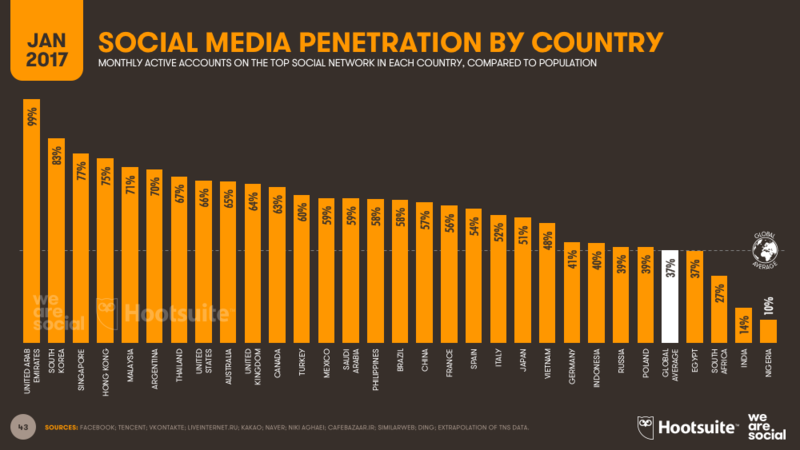 This places Singapore in the top three countries globally in terms of social media penetration. Only United Arab Emirates (99%) and South Korea (77%). 70% of social media users access their accounts using mobile devices. This is double the global average of 34%. According to an AIA survey, 2 in 3 Singaporeans admit that they have a social networking and Internet addiction. Singaporeans are also a more discerning group and have less tolerance for irrelevant brand communications. One in five (22%) say they ‘actively ignore’ social posts by brands. However, 40% of younger Singaporeans (16 – 24 year olds) say they trust what people say online about brands more than official sources. This means that brands need to stop relying on dry press releases and start listening to what is being said about them online. There are 3.5 million people on Facebook in Singapore. Of this, 3.2 access Facebook on their mobile devices. 1 in 4 Singaporeans on Facebook browse the platform even while watching television, spending 17 minutes out of a whole TV hour on their Newsfeed. Facebook has made a deal with the Singapore government to place its 143,000 civil servants on Facebook Workplace. The Singapore government hopes that it will be more successful than its failed intranet attempt in 2013 called ‘Cube’. While Facebook is still the most popular social media channel in Singapore, it seems to be following the global trend of losing its younger users. You can’t fault them; Facebook stops becoming fun once your parents get on your friends list. Younger Singaporeans are instead flocking to Instagram. 63% of connected consumers use Instagram in Singapore in 2017 (a growth from 51% in 2014). This places it third in the region, behind Malaysia (73%) and Hong Kong (70%). Instagram has 1.9M users in Singapore. 54% are female and almost 85% are younger than 45. There seems to be a rise of the ‘Insta-Gran‘ in Singapore. 33% of Internet users aged 55-65 now use Instagram. Despite doubling from 19% to 37% within a year, Snapchat usage in Singapore is still behind countries such as Hong Kong (46%), New Zealand (39%) and Malaysia (37%). There are over 7.773 billion Internet users, representing 50% of the world’s total population. This is amazing considering that Tim Berners-Lee introduced us to the World Wide Web only in 1989. The global average Internet penetration rate is 50%. There are 2.789 social media users, giving us a global average penetration rate of 37%. Most of these social media users (2.489 billion) will use their mobile to access their accounts. 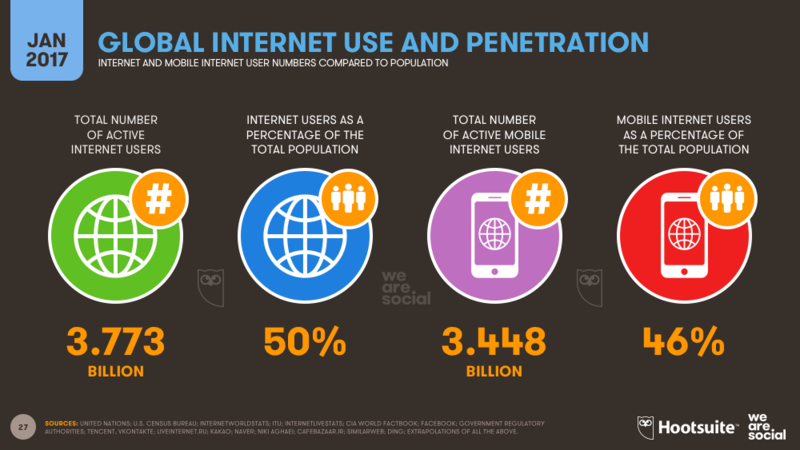 Mobile social media penetration stands at 34% of global Internet users. The social media growth rate in Asia-Pacific (APAC) is over 50% year-on-year. This means that there are over 1.5 billion using social media in APAC. More interestingly, 95% of these people access social media via their mobile devices. This is the highest ratio in the world. There are over a billion smartphone users in APAC. There are 4.917 mobile Internet users, representing a mobile Internet penetration rate of 66%. The global share of web traffic has grown very quickly. 2017 marks the first year that mobile traffic is more than desktop traffic. Mobile is now 50.3% of web traffic. It comes as no surprise that the largest social network in the world is Facebook. It’s the gorilla in the social media space as the top three largest networks all belong to Facebook. 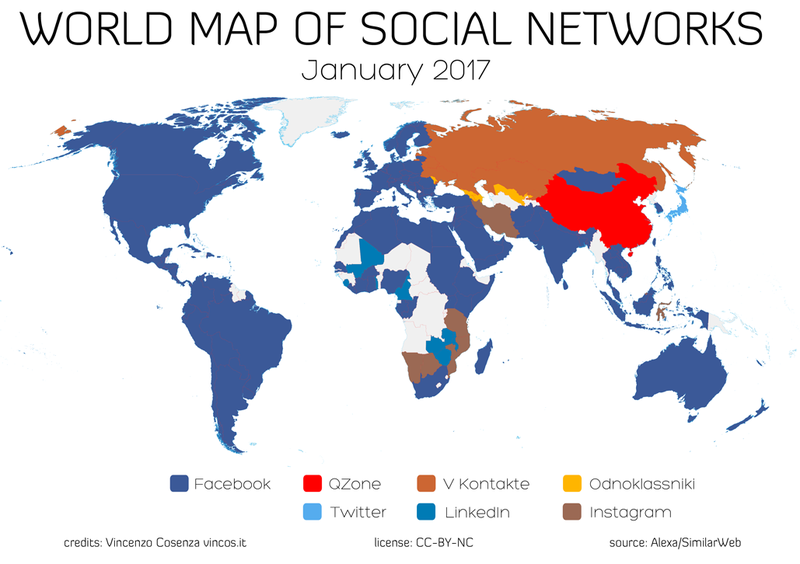 In fact, if Facebook were a country, it would have a larger population than China. Facebook is the top social network in 119 out of 149 countries. In fact, 22% of the world’s population is on Facebook. Instagram is a close second, especially in the Southeast Asia region. Of those 1.871 billion Facebook users, over 87% of them access Facebook using their mobile devices. Most Facebook users fall between the 18 – 34 age groups. This will differ widely across regions though. However, Facebook is fast losing this demographics to other channels. The fastest growing demographic on Facebook is the 55-64 age group. In Asia-Pacific, 427 million users log into Facebook daily. This is the largest number of daily active users in the world. On average, each person can be exposed to up to 1,500 messages whenever they open their Facebook newsfeed. That’s a lot of competition for their attention. Every minute, there are an average of 500,000 new Facebook ‘Likes’. Facebook Messenger has more than 1.2 billion monthly active users. LinkedIn has over 450 million users. 91% of B2B marketers are using LinkedIn for sharing content. 71% of professionals feel that LinkedIn is a credible source for professional content. The Snapchat and Instagram penetration rate in Asia-Pacific (APAC) stands at 15% and 39% respectively. Instagram has over 400 million active users of which 80% are based outside of the United States. 68% of Instagram users engage with brands regularly, as compared to 32% of Facebook users who regularly engage with brands. Instagram is fast becoming the new window shop. 60% of users say they learn about products and services on Instagram and 75% say they take action after being inspired by an Instagram post. ← How To Be Creative With Your Social Media Posts?